Beth has done a great job in her earlier posts to describe what she and the kids have been up to recently. However, I have been quite busy these last few weeks as well. That was one of the reasons for our arrival a few weeks before the term started. School officially started Monday, though I started working, reading, writing, as soon as I could. I dropped in on relevant lectures and seminars. I have met with scholars, fellow researchers, and ministry leaders. I have spent time just trying to find my way around the library offerings here. I am now moving to spending my days in the library with a reading list. A friend asked me recently how the THINKING has been going. Yes, the thinking is good. I am meeting some fascinating people. Their unique perspective and experiences bring a great depth to the learning. I think the unique (and still new to me) College System works. I’ll talk more about this in tomorrow’s post, but the system of College and University relationships here is unique. In the US, my college membership was related to my field of study; my undergrad college was education. At Durham (I hear that only a couple of the older schools in the UK, like Durham, do this) the college is not solely based upon your field of study, but about a culture of the College. Mine is St. John’s College. The motto, I think, sums up St. John’s culture: Fides Nostra Victoria, Faith is Our Victory. St. John’s has a unique relationship and strong ties with Cranmer Hall and the Wesley Study Centre, which prepares future Anglican and Methodist clergy, respectively. St. John’s is the logical choice for students of Theology at Durham University. So your college membership is not limited to your field of study. Instead the college brings people from various backgrounds, study interests, and goals to a common ground. This provides for some interesting opportunities. One such opportunity came last week at the Post Graduate’s Welcoming Formal Dinner. That doesn’t count my new colleagues from the US, Finland, France, Barbados, and the rest of the UK. So what has that done to my thinking? It has been great to hear their stories and see how they got here and their varied theological interests. All of them paint a picture similar to what I am doing–each of us in our own way. At the same time, they help me see things I hadn’t seen before. I see that God is at work in His people and I am again amazed that I get to take part in a small piece of that. Then there’s the reading! I have had some nice “AHA!” moments this week. Then I am quick to find someone mentioned above to explore this discovery with them. We work on that a while, then go back to read and discover some more. So, that’s as small piece of what I have been doing. Later I want to talk about the HOW AND WHY of the work. Tomorrow we will talk more about the College/University relationship and the Matriculation Ceremony this week. 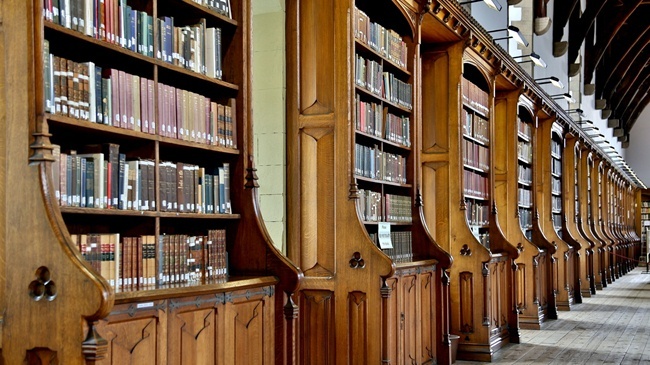 The Durham Cathedral Library is one of my theological libraries. While it has a good collection of modern theology works, the holdings date to the 6th century. The Monks of Lindisfarne, who later founded the community Durham, began the collection. This room is the former Monks’ Dormitories and now has study spaces available. Wow! I knew you were called there for a great formal education but I had no idea that you would have such a great opportunity to further expand your worldview far beyond the British isles. Fantastic! Thanks, Gene. It is a blessing to see what is going on in the lives of these wonderful people and the way they are preparing to do even more great things.